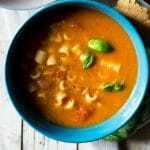 The easiest 30-minute pasta fagioli soup made with sauteed veggies, borlotti beans (cranberry beans), tomato and of course pasta! It'so hearty, healthy and sooo flavourful. Finely chop the carrot, celery, red bell pepper and onion. Saute the veg in a large pot with the olive oil for 5 minutes, don't let it brown. Meanwhile, chop the garlic and add it to the veg then saute for another 1-2 minutes. Once all the veggies are soft add the chicken or vegetable stock and canned plum tomatoes. Bring it to a boil then turn down to a simmer for 10 minutes. Add the borlotti beans (cranberry beans) and simmer for 1-2 minutes then blitz around half of the soup for a smoother texture using an immersion (hand-held) blender. Next, add the pasta and simmer the soup for another 7-8 minutes or until the pasta is al dente, serve. If you are not eating this soup straight away then don't add the pasta as it will swell and eventually turn mushy and too soft. Instead add as much pasta as you're going to eat so if you only want 1 bowl, heat the soup up with just 1 small handful of dried pasta. I like to add borlotti beans but you could also add cannellini (white) beans or pretty much any pre-cooked and canned beans you prefer. If you prefer a chunkier soup then you don't need to blend it. I prefer a smoother texture and like to blitz around half of the soup before adding the pasta. This soup makes 4 generous servings or 6 small servings.